The Department of English is committed to community-building. We strive to work toward positive change on our campus, in Morgantown, and in our state. We do this, in part, when English department faculty and students collaborate with community partners. This page highlights some of those projects. The Bolton Workshop for Writing Teachers is a poetry outreach program generously supported by a gift from one of WVU's longtime benefactors, Mrs. Ruth Bolton, and coordinated by Professor Mary Ann Samyn. 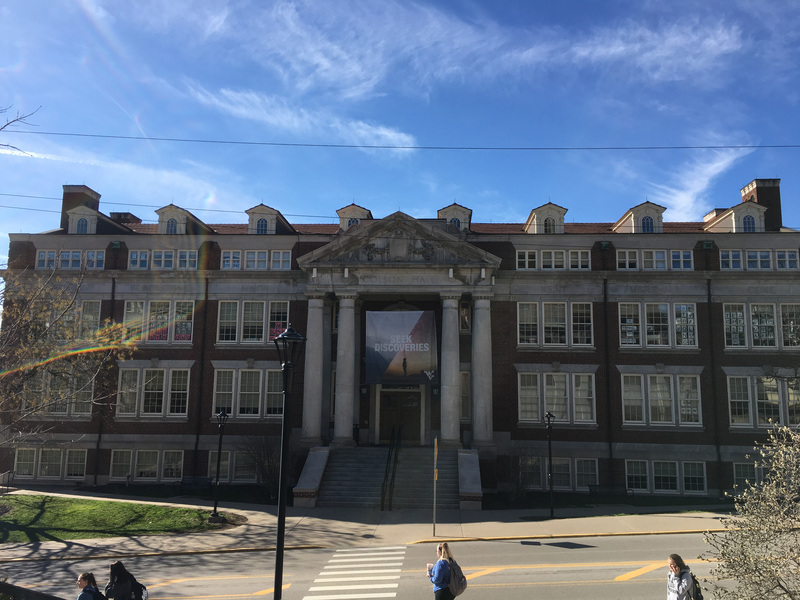 Each fall the Bolton Workshop brings MFA students and local elementary, middle, and high school teachers together to form a community of poetry readers and writers; each spring, MFAs visit the teachers' classrooms and work with their students on poetry writing. For more information, contact Professor Mary Ann Samyn. Starting in the spring of 2017, Eberly Writing Studio consultants will be helping Morgantown High School teachers and students establish the first K-12 writing center in West Virginia. In the high school writing center’s pilot year, Eberly Writing Studio consultants will serve as mentors and assist in training high school peer tutors. For more information, contact Professor Nathalie Singh-Corcoran. The West Virginia Green Zone (WVGZ) is a project founded by former Army Sgt. Howard Davidson, and Professor Tom Sura is the faculty advisor. As a volunteer, grassroots effort, WVGZ focuses on helping WVU’s faculty, staff, and students feel greater confidence working with student veterans by increasing awareness of the institution’s policies regarding student veterans, providing student veterans with a voice in the community, and building personal connections between WVU faculty, staff, students, and student veterans. For more information, contact Professor Tom Sura. The English Department at West Virginia University expresses emphatic support for the West Virginia state teachers striking for fair compensation, adequate insurance coverage, and the future of this state. As public educators ourselves, we appreciate the importance and difficulty of teaching in the k-12 public system. Teachers do not enter the profession for money, for recognition, or for themselves; teachers teach to serve their communities, and do so too often without sufficient recognition of the mental, physical, and emotional sacrifices their work requires. K-12 teachers do not merely transmit information to their classes. They are also counselors, social workers, mentors, confidants, and often part-time parents to their students. The youth of West Virginia is the future of West Virginia, and that future is bleak without strong, well-supported teachers to guide it. Further, West Virginia cannot compete economically on the national level without a strong and well-funded public school system, and it is important to compensate educators competitively to attract and retain the best teachers for our children. We urge our governmental representatives to increase severance taxes on the oil and gas that leave this state to raise teacher salaries, provide a permanent fix for PEIA, and ensure the future success of West Virginia. The West Virginia Constitution states that “The Legislature shall provide, by general law, for a thorough and efficient system of free schools.” The current salaries for teachers in West Virginia rank 48th in the nation. This is a deprivation of the public good and an abdication of governmental responsibility. Our support for public education is unwavering, and we thank the teachers selfless, strong, and brave enough to stand up every day, and especially this week, to build a brighter future for the rest of us.